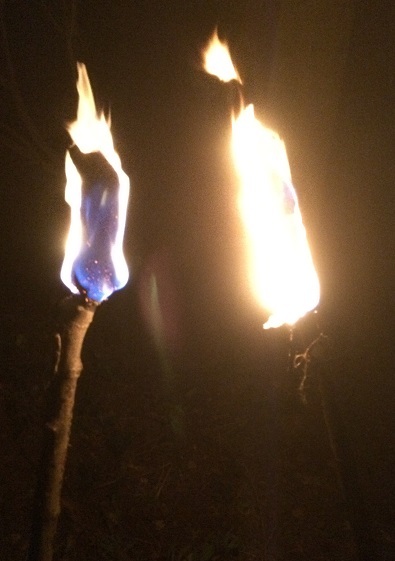 In this, our fourth and final blog of this series we will be looking at a comparison between two hand held torches, along with some different fuel options. 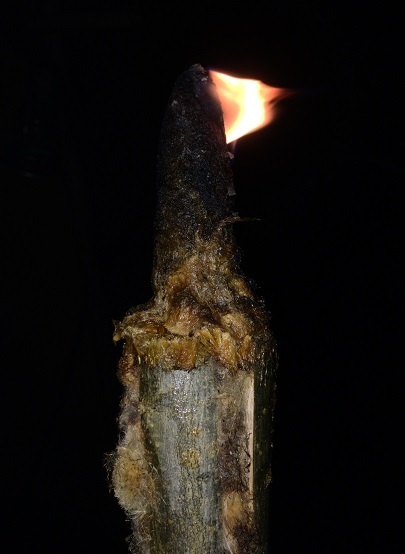 Namely greater reedmace (nature’s own hand held lantern) against a rag torch, depicted in just about every survival movie out there. Firstly let’s take a look at the more natural option of the two, greater reedmace. Our first test was to use one green, picked fresh on a dry day that afternoon and tested later that evening. It was soaked in melted lard allowing it to absorb as much as it would hold. With moisture still held in its core the capillary action of the seed head was reduced significantly as the moisture seemingly repelled the fuel from soaking in significantly, compared to the dried out one. The realisation of this became immediately apparent with the poor flame the green one produced in comparison and the burn times that were yielded. The green example burdened poorly for only five minutes compared to the fully dried out one which managed 38 minutes. It was now time to compare fuel types. With a base line set with the lard soaked torch it was time to put the vegetable oil to the test. The initial results were encouraging as the oil took to ignition more readily, giving a steady and stable flame. This finally petered out at an impressive 50 minutes. 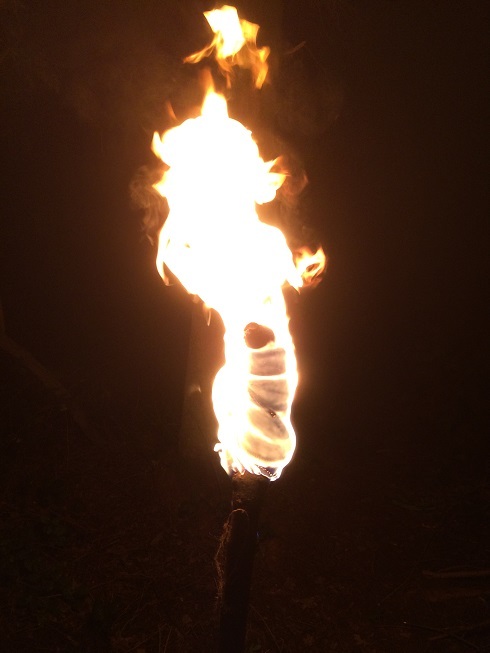 Now to the second torch we are looking at in this blog, the rag style torch. 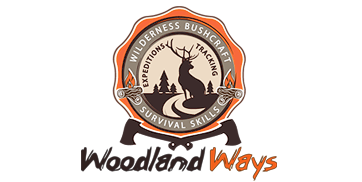 As the name suggests it is nothing more complicated then wrapping a length of natural fabric around a sturdy stick to use as the reservoir for the fuel of your choice. For good measure the end of the material was split in two along its length, double backed and tied with a surgeons knot tucked under existing layers to prevent it unraveling. 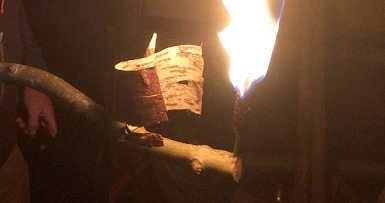 Both torches were wrapped in equal quantities of hessian and soaked to capacity in the two fuels of choice for this test, vegetable oil and paraffin. 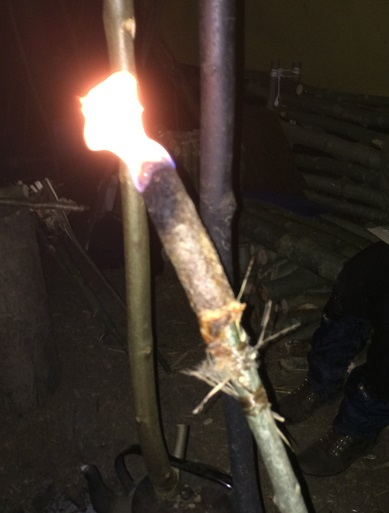 Both torches were ignited, the vegetable oil took a little encouragement compared to the paraffin torch which lit easily, giving a strong light which flood lit the area with light relatively quickly. The vegetable oil torch took a little longer to establish itself, but also produced a very usable flood lit light. As the test continued it became apparent that the vegetable oil torch began to offer greater longevity of light. The paraffin fuel option although offering a strong and robust flame fell to the expense of its short burn time of only 16 minutes. The vegetable oil lamp on the other hand, burned less vigorously initially, but offered a stable and prolonged burn time of 50 minutes. 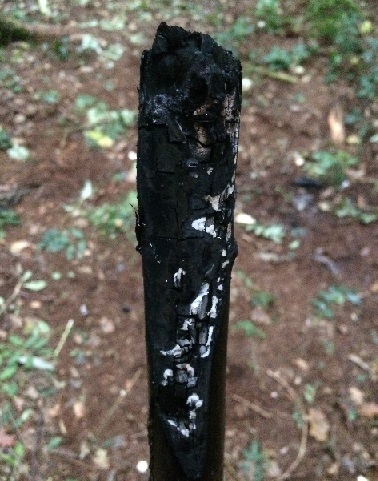 Remains of the vegetable oil torch, which burnt right through. 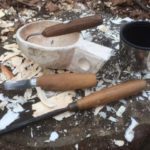 What this little series has highlighted to me is that there are many ways to bring light to the darkness of your evening with varying degrees of preparation. 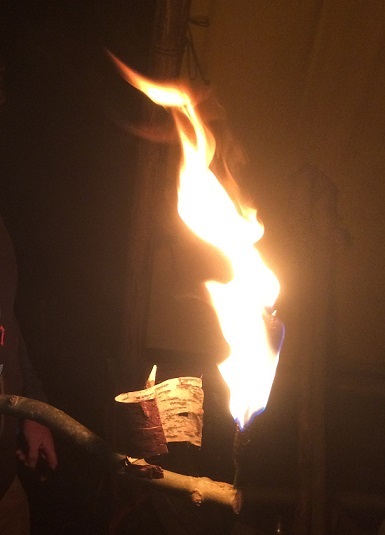 Whether you simply enjoy the glow of your evening campfire to enjoy the evening with, or wish to vanquish the darkness with your Indiana Jones style torch, they are all relevant and suited to different purposes. 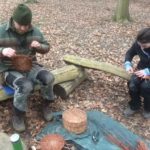 The one that seems to surprise most people however is the little pinch pot. Something that you can make from the earth with your hands with the smallest amount of fuel will provide usable localised light for the greatest duration of any we have tested in this series.